Yes, the famous Penang Road Cendol. 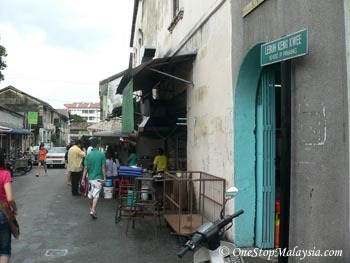 I've heard people saying that your trip to Penang would never be complete without trying the famous Penang Road Cendol. I'm sure you are reading this now because you want to know, is it that good? How does it look like? How can I get there? Or just want to reminiscence the time you had it yourself. Well, it just looks like any ordinary cendol. 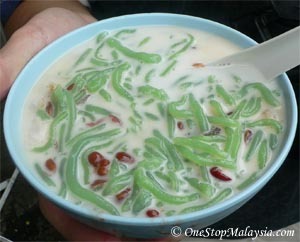 It contains the usual cendol jelly, santan, brown sugar and kidney beans. And of course crushed ice. WIth me staying in Penang, I usually go there whenever I'm nearby. I have to say that it is quite good. I feel that its quality is inconsistent, but that could be due to factors such as weather and my thirst the time I eat it. The ingredients they use are quite fresh. I would recommend it to visitors to Penang to try it out. 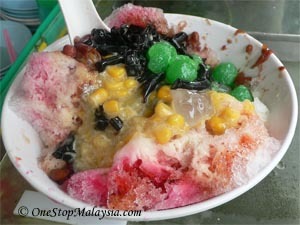 Besides cendol, they have Ais Kacang (ABC) which is pretty good as well. It contains crushed ice, the usual colouring and flavouring (syrup, evaporated milk), corn, "cin cau", some type of green jelly, and of course red kidney beans (kacang). The also serve some drinks, which I only remember them to be chrysanthemum, some leafy plant (which is said to give a cooling effect on a hot day), and a pink drink with jelly. I need to find out what they are. There are 2 stalls located opposite to each other. 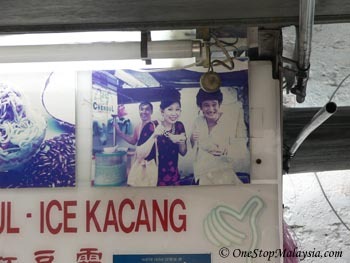 Both claim to be the "Famous" Penang Road Cendol, but you can easily tell the "more" famous one. It is located beside Joo Hooi restaurant. The crowd can get really big on certain days, such as long holiday weekends, school holidays, or just a hot afternoon. Please note that you can have the cendol inside the restaurant, but you need to pay a surcharge of RM0.50 per bowl. 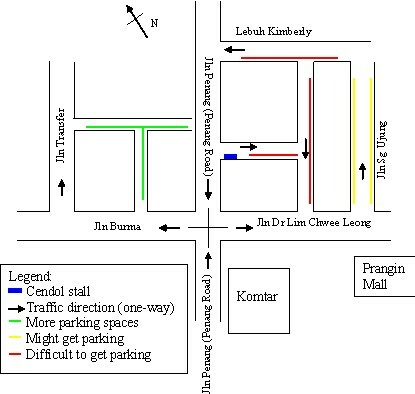 How to get there: It is located on Lebuh Keng Kwee, off Penang Road. It is a walking distance from Komtar and Prangin Mall. The landmark I can describe best is the 5-branch overhead pedestrian bridge. If you can't find it, just ask anyone and I'm sure they can point you right to it. Parking can be a little bit difficult. I suggest that you find any parking spot along Penang Road or near Komtar and walk. Questions or comments? Leave a comment below. Thank you.